In a major embarrassment for Gujarat model, of the 21 samples taken by officials of the state government's environmental watchdog Gujarat Pollution Control Board (GPCB) in two villages of Vadodara district and analyzed by its laboratory in Gandhinagar, the state capital, to find out pollution level in groundwater, 16 were assessed as highly contaminated – these were, in fact, found to be discharging reddish, brownish, reddish, or yellowish water. The samples, says a GPCB report, were taken in October and December 2018 following a complaint the official watchdog body’s Vadodara office received from the top environmental voluntary organization, Paryavaran Suraksha Samiti (PSS), and Farmers’ Action Group (FAG), representing farmers of the region. 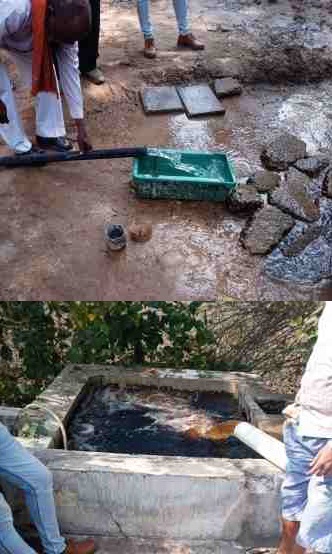 Following the complaint, says the report, officials of GPCB regional office and vigilance office, Vadodara, swung into action with Rohit Prajapati of PSS and Ghanshyambhai Patel and Kirit Amin of FAG, visiting villages in Padra taluka to examine “21 borewells/abstraction wells” after taking their “water samples”. 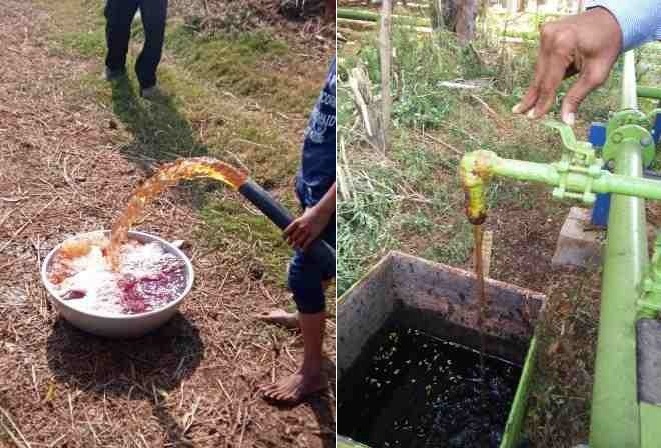 In the 12 other borewell water samples, collected from villages Luna and Umayara in the areas surrounding several other industrial units, the engineers found several variations, ranging from “dark yellow” and “reddish” to “yellowish”. 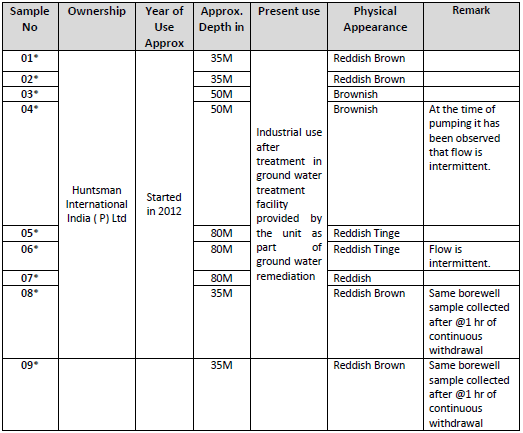 Only five of the 21 samples, including three meant for drinking water, one for panchayat, and one for an industrial unit, were discharging “colourless” water. 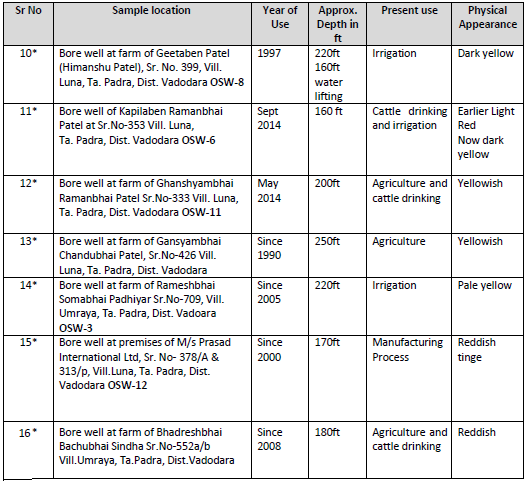 The report says, in the borewell of the farm of Geetaben Patel in village Luna, the water, being used for irrigation for the last six years, was “shining yellow”; in the borewell of Kapilaben Ramanbhai Patel’s farm also in Luna village, the colour of the water – being used by cattle for drinking and irrigation – was “reddish” to “dark yellow”, though earlier it was “light red”. The situation was found to be the same in the water coming out of the borewell of the premises of an enterprise in village Luna, where the water had “reddish tinge”, and the borewell of the farm of Bhadreshbhai Bachubhai Sindha of Umraya village, which discharged reddish water, meant for “agriculture and cattle drinking”. Calculates the environmentalist, COD was found to be 2,225 mg/l on October 16, 018) and 2,722 mg/l on December 26, 2018) in village Luna; TDS (total dissolved solids) was found to be 10,172 mg/l on October 16, 2018, and 11,188 mg/l on December 26, 2018); and BOD (biological oxygen demand) was 198 mg/l on October 16, 2018 and 72 mg/l December 26, 2018. In his strongly-worded letter to Government of India and Gujarat government officials, warning that if they do not act, it would be construed as “contempt of court of the Supreme Court order, dated February 22, 2017”, in PSS activists’ Writ Petition (Civil) 375 of 2012, and “may result in suitable further action”, Prajapati says, “COD of groundwater has crossed the acceptable or permitted limits of the industrial effluent discharge, which is 250 mg/l COD” -- a “disastrous situation”. This is true throughout the country. That is why none of our rivers will never be pollution-free. Maharashtra is supposed to have the dirtiest rivers.